As the final source for our understanding of Erasmus’ general views on scripture, canon, and authority, we turn to the Enchiridion, the Handbook of the Militant Christian. Immediately notable in this work is Erasmus’ citation of both scriptures and the writings of the church fathers throughout to affirm his arguments (Enchiridion, 24-93). Here we see Erasmus argue that knowledge of God, the subject matter of theology, was revealed through Christ, and that the living presence of Christ was best encountered through the words of scripture (Jenkins, 67). Fundamental then was the centrality of the scriptures in the Christian life, as well as the understanding that such scriptures were divinely inspired by and proceeding from God (Enchiridion, 53 and Jenkins, 36). Here Erasmus admonished Christians to read and know the scriptures, as such activities were fundamental to living the philosophy of Christ and to traversing the ‘road of virtue’ in the Christian life (Enchiridion, 63-4 and Jenkins, 34). Key scriptures for Erasmus were the holy prophets, the gospels, and writings of the apostles, especially Paul (Jenkins, 34). While Erasmus advocated the reading of the scriptures by all who can, he carefully noted that authoritative interpretation needed to be undertaken in the study of the scriptures original languages and the application of textual and linguistic scholarship (Enchiridion, 53 and Jenkins, 37). This position especially conflicted with medieval scholastic practice, which emphasized the magisterial interpretations and commentaries over a linguistic perspective. In the Enchiridion Erasmus wrote against the philosophical underpinnings of scholastic interpretation, arguing that while Aristotelian philosophy may have had a place within theology, it could not continue to hold its central place within constructions of Christian theology (Jenkins, 67). In this respect it seems noteworthy that Erasmus himself seems to have come from a Platonic, rather than Aristotelian, perspective that remains evident throughout his arguments in the Enchiridion (Enchiridion, 36-7). Having reviewed his perspective here, it seems that clearly represented in the Enchiridion was Erasmus’ understanding of the centrality of scripture, interpreted through textual analysis and the perspectives of the fathers, as the best means by which Christians were to understand the philosophy of Christ and salvation (Enchiridion, 53 and Jenkins, 72). To briefly summarize Erasmus’ perspective on scripture, canon, and tradition before turning to his perspective as evidenced in the Diatribe it seems clear that he understood scripture as the source of Christian truth and of the transforming power in of Christ in the lives of Christians. Because of this the scriptures should be used and available to all, though its final interpretation should only be undertaken as a matter of serious textual, linguistic, and contextual analysis. The Vulgate, because of its faulty textual transmission and distance from Christ and the Apostles, could not be understood as authoritative, especially in those places where it clearly contradicted the meaning of the Greek. The canon of scriptures included within the Vulgate, however, remained unquestioned by Erasmus as a matter settled by the church. 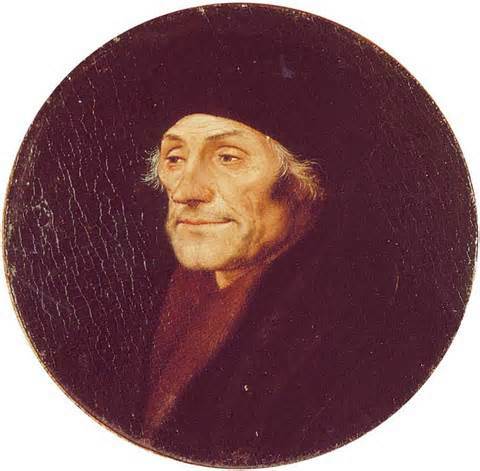 In matter such as canon or ambiguity, the Church still functioned as an authoritative body for Erasmus, though he found the scholastic thought of the church unconvincing, preferring the writings of earlier church fathers and the perspectives of textual and linguistic scholars. Therefore it seems clear that Erasmus found the twenty-seven Greek writings of the New Testament, traditionally having been handed down and interpreted by the church fathers and currently to be read in light of textual, linguistic, and contextual analysis, to be the ultimate sources of authority for the church.